Amazon appetizer: Welcome to Destiny, Ohio—where two families have been at odds as long as anyone in town can remember. 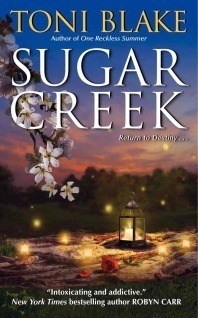 My thoughts: When I stumbled upon Toni Blake's site and read an excerpt of Sugar Creek I instantly knew I HAD to read it! I was lucky enough to win an ARC and thus didn't have to wait long to sink my teeth into the novel (it is planned to be released on 1 June 2010, mark your calendars! ), and not only did it live up to that exceptionally funny and sizzling excerpt, but it was so much better! The story behind Sugar Creek could be summed up pretty simply: big city girl goes back to her small hometown to help out grandma and sparks fly with the drop-dead gorgeous local cop. But it is so much more than this backbone of a story!